More tower news (it’s Greenpoint’s turn)! Matt Chaban in the Observer has a piece on the imminent launch of phase one (at least) of the 10-tower project at the very north end of the Greenpoint waterfront. The project would be completely as of right, thanks to the 2005 rezoning, and would presumably benefit greatly from the construction of Barge Park to the north, if that ever happens. 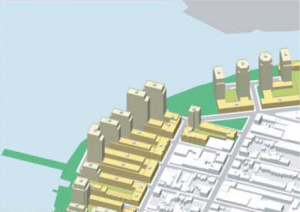 As with other waterfront developments, the project will include the buildout of a waterfront esplanade and the construction of 20% of the units as affordable (onsite, I believe).